The three figures in this work are, from left to right, Berthe Morisot, Antoine Guillemet (a landscape painter and friend of the Impressionists), and Fanny Claus (a concert violinist). In the background can be seen a boy bearing a pitcher, presumably intended for those on the balcony. Manet claimed that the idea for the work came to him after seeing a group on a balcony in Boulogne; another inspiration is clearly Goya's Majas on a Balcony, though there are several other treatments of this theme also. 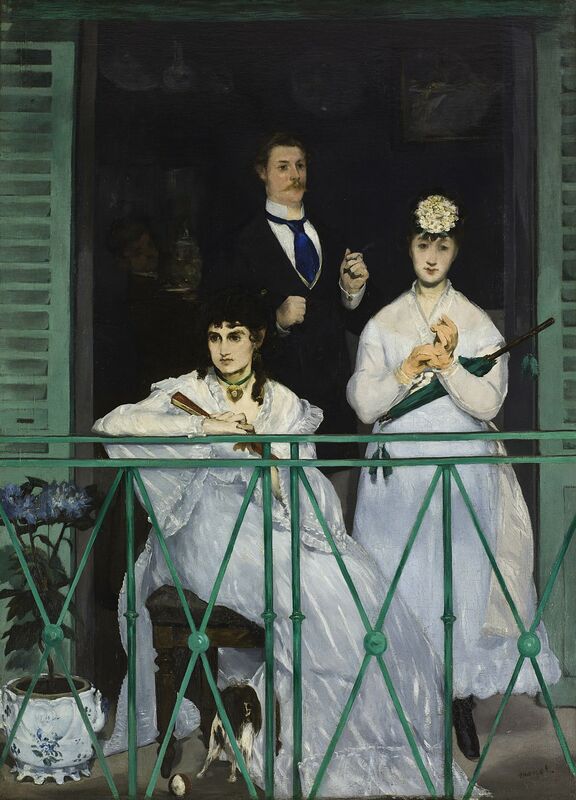 While Manet pays homage to the Spanish artist, he also emphasized their differences. In contrast to the animation and warm, harmonious coloring of Goya's painting, Manet used bright, contrasting colors, and his figures seem oddly posed and distracted. Their formality is highlighted by the lack of activity: each figure gazes in a different direction and there seems to be no interaction. The man's hand gestures and expression suggest that he is totally absorbed in his thoughts, while Fanny looks blankly out at the viewer without seeming aware of anything before her.